To continue with my earlier post on the Wild West Cowboy town at HERE which is long and full of photos, Mommy Jane had to separate this out coz' too many beautiful photos captured and would like to share some here at my post. If you want to see more of it, do visit Wild West Cowboy town to experience it yourself. For this post, I would like to share on our experience at Alive 3D Art Gallery, Theme Family Karaoke and lunch at Tasik Villa Resort. All this interesting places together with Wild West Cowboy Town are located at Dataran Segar City. Alive 3D Art Gallery features 50 interactive painting & optical illusion within 5 themes which are Adventure Zone, Aquarium Zone, Animation Zone, Exotic Zone and Dark Art. This is the place where all of us were challenge to have a creative posture. For each of the post, you can refer to the example that stick at the wall on how you should post it and how to take the perfect photos. They even draw a photo of the camera so that we knew where we should stand and the best place to take the photos. There are too many creative photos but I will put a limit here so that all of you could go there to have your own post. We spend almost an hour plus to take all the photos at their 3-storey shop lot. The entrance ticket price for Alive 3D Art Gallery is at RM25 per adult and child at RM20. For MyKad holder, adult at RM20 and child at RM15. It is open from 11 a.m. till 10 p.m. on Mon to Friday and on weekend from 10 a.m. till 10 p.m. Contact at 06-6515401. If you wish to go to Wild West Cowboy together with the Alive 3D Art Gallery, then get the package where you could save more. Adult at RM70 and Child at RM55. For MyKad holder, adult at RM58 and child at RM43. As for lunch, we went to Tasik Restaurant & Cafe which located at Tasik Villa International Resort. The resort just opened on last year December. The food is in big portion and it is indeed delicious. For nasi goreng kampung, you can opt for non-spicy one. My Little Angels love their fried chicken which is tasty and Daddy loves their chicken chop. The restaurant area is big and able to accommodate more than 100 diners and it is a kids-friendly restaurant too. More place for the kids to move around and the waitress here is friendly too. Since my Little Angels love their fish crackers so much, the waitress gave us some for free. After our lunch, we walk around the resort. The surrounding area of Tasik Villa Resort is beautiful and suitable for kids to stay. When my Little Angels saw the paddle boat, they ask for a ride and the ride is actually free for their guests. For non-guests, we need to pay around RM20 for 15 minutes ride at their man made lake. At night, we went to Theme Family Karaoke. Did you know that karaoke can help to improve our child's cognitive development ? It is actually a great way for kids to let off their extra energy, express emotion and it is also a helpful toll in teaching our kids to read. Come and sing at comfortable karaoke room with different themes that suit for the family with young children and with friends. Suitable for birthday party and any celebrations. Stage Family Karaoke is open daily from 12 p.m. to 12 a.m. Call them for reservation of your favourite theme room at 06-6515401 and price per room is listed at the photo below. All these interesting places for you to spend with your family and friends are located at Dataran Segar City, Lukut. Take a whole day off and enjoy the rides and the attractions in 1 place. 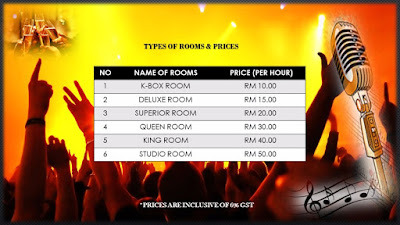 Do check out their website at www.segarcity.com and facebook page at www.facebook.com/segarcity for more information and promotion. If you're looking for a new interesting places at Port Dickson to spend your times with your family and friends, then do bring them together to Dataran Segar City. Create a lasting memories that kept our spirits high and boost our confidence. These place is a perfect gateaway for families and friends. Ezna, betul. Like a real one. Do check this out coz' it is fun. I love the boat kayaking too. I haven't gone to 3D gallery at pd. Not so far but so hard to make some time ha ha :) Looks so interesting, Jane. nowadays there so many 3d museum..insteresting place to pose and snap picture especially with kids..the blackpepper sauce looks so yummy!